Eric Moran is Philadelphia native. The former United States Marine was also a professional wrestler for companies like Gorgeous Ladies of Outrageous Wrestling, Extreme Championship Wrestling, Cyberspace Wrestling, and Women’s Extreme Wrestling. Eric has appeared on television shows including The Jenny Jones Show and Heavy Sedation. Eric is one the founders of Together Brothers Productions, an independent film production company based on the east coast. He’s worked as film writer, director, producer, and actor with over ten independent films and web series like, The Deep End, Legacy, and Trek Isolation. In 2014, The Smoke became a household name in the world of cosplay when he hosted the Syfy channel’s series, Heroes of Cosplay. His massive physique, cool demeanor, and confident style have led him to be a host for other panel events for celebrities. 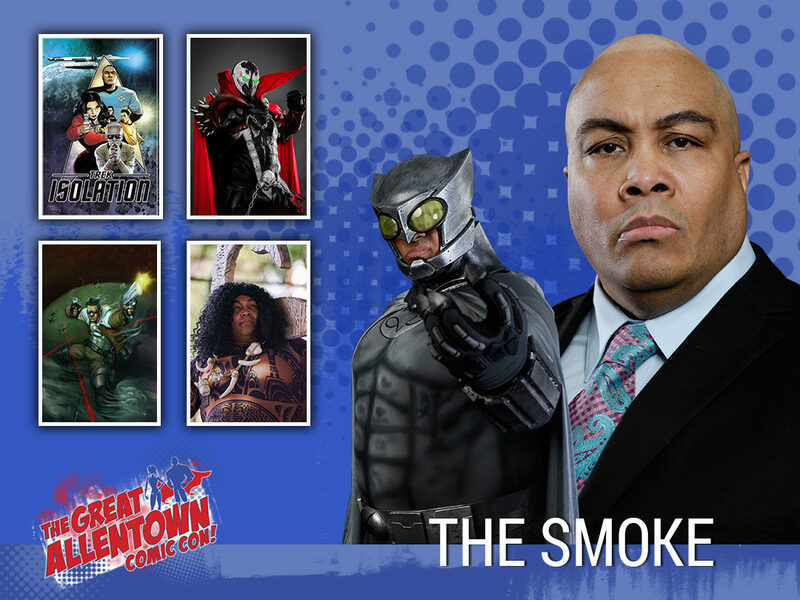 The Smoke was also included in projects highlighting in the world of comic books for Big City Comics Studios, DC Comics as Freight Train, and currently appearing in George Perez’s, Sirens as well as the films, The Surge of Power and JUN, The Spawn Fan-film, “Choices” and appearing on AMC’s Comic Book Men. The Smoke routinely visits school to inspire and motivate kids as well as participates in charity events such as The Peace Fund Games.